Thank you for being a friend, to us and to the isolated families whom we serve. Please know that you and all of your intentions remain in our prayers. We respect you, we value you, we honor you. READY, SET… (left) A mile from the KNOM studios, general manager Ric Schmidt ensures that the station’s remote broadcasting equipment is working properly. His right hand holds a two-way unit, and over his shoulder hangs a high-fidelity transmitter. Both have provided listeners with critical information during local emergencies. The photo was taken in May, and you can see that the Bering Sea ice behind Ric is still solidly frozen. It may have broken up and floated out to sea by the time you read this—or not. SPEAKING OF EMERGENCIES, thankfully, one failed to happen. A magnitude 6.6 undersea earthquake about 400 miles southwest of Nome could have resulted in sudden massive pile-ups of ocean ice onto shorelines, and officials had KNOM repeatedly warn listeners of the potential danger. COMING NEXT MONTH: July 14th begins the KNOM radio mission’s 40th year on the air. We remain true to our original purpose, but as you can imagine, times have changed. What has remained the same? What is different? Please tune in next month! BY FAR, KNOM is the oldest Catholic radio station in the United States, beaming inspiration, news, education and positive entertainment in a signal that is extremely popular throughout 100,000 square miles of road-less Alaska. This valuable service is entirely thanks to you. 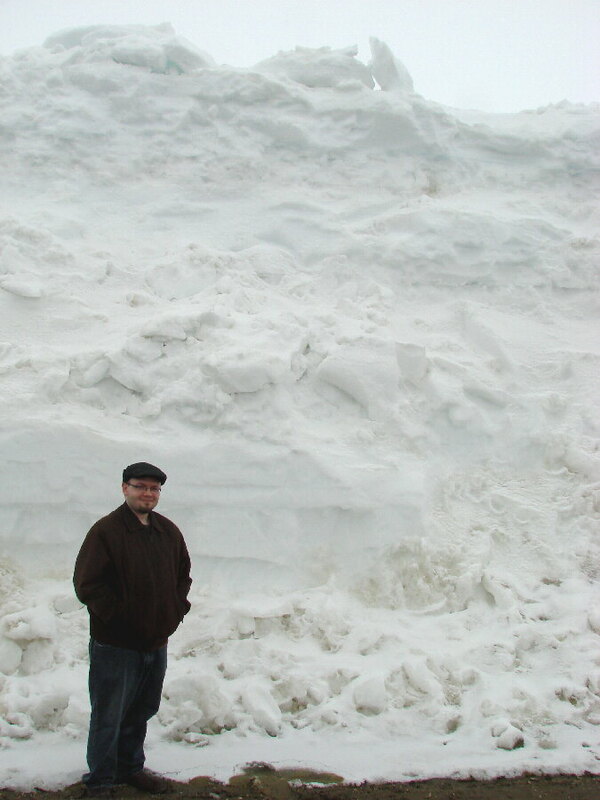 SNOW BUSINESS: (left) In May, KNOM volunteer news reporter John Francis visits a plowed section of gravel road about four miles east of Nome. It’s an area of especially heavy drifting. Though it’s May, there’s still plenty of winter ahead for the arctic! Last month, John headed home to Arkansas, after nearly two years of volunteer service to the mission. Please join us in wishing him well, and in praying for this fine young man. 17,000: That’s how many inspirational spots KNOM has aired since January 1, plus an equal number of educational ones, thanks to you. Thank you! FROM THE NOME HOSPITAL came a note last month. “I just wanted to send you all a big thank you for all your work and the healthy and inspirational messages you share on the radio. One of my patients yesterday mentions that she listens to the radio for healthy tips and follows them…In particular, she mentioned she started rinsing off her canned fruits to decrease the sugar she is consuming. I love to see all our efforts making a difference. Thank you!" GABRIEL AWARD: June 3rd, general manager Ric Schmidt is headed to New Orleans to accept KNOM’s Gabriel Religious Radio Station of the Year Award. It is the mission’s 18th top Gabriel, and the 15th year in a row. Ric will humbly accept the award on your behalf. 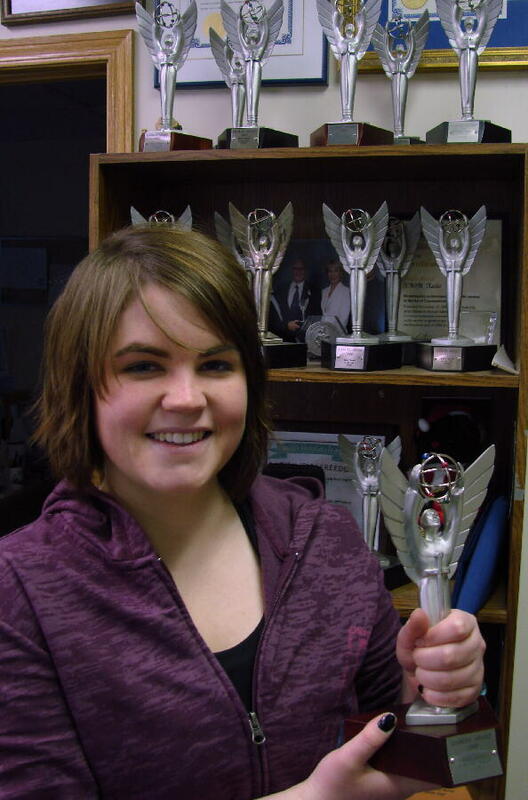 (Left) In December 2009, volunteer music director Leah Radde holds KNOM's 17th top Gabriel. SPOTS: Educational spots on KNOM this month dealt with saving money, surviving teen tough times, scholarships, autism, tobacco use, diabetes awareness, nutrition, child abuse, suicide, Alanon/ Alateen, sexual abuse, depression, earth science, Alaska science, foster homes and Alaska History, among many others. 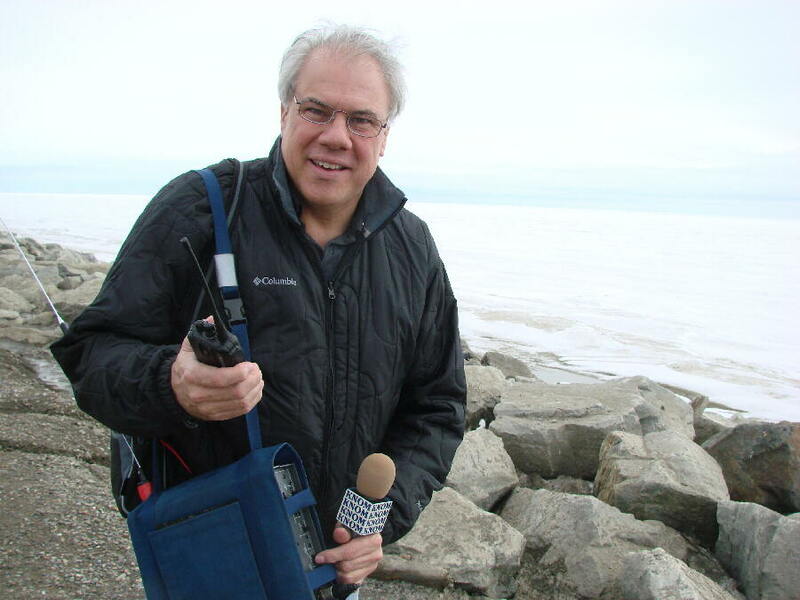 Ric Schmidt continues producing the station’s popular “Today in History” spot, and last month, KNOM began airing a new series, “King Island Inupiat Phrase of the Week.” Inupiat (in-OO-pee at) is the language of northern coastal Alaska Natives. Please consider adding the KNOM Radio Mission to your will. We prayerfully place all bequests into special funds that provide for future major improvements and protect the mission against emergencies. 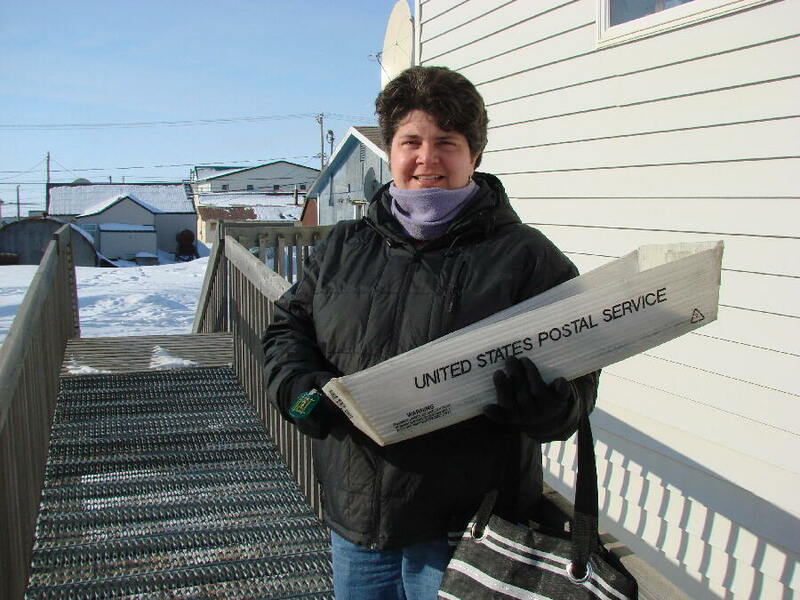 SHE HAS MAIL: KNOM office assistant Betsy Brennan prepares to deliver letters to the Nome post office. Betsy was a KNOM volunteer from 1988 to 1990. Today, she lives in Nome with husband Mike and two children. This May day is beautiful, but due to blizzards or fog, it’s not unusual for Nome to see a week and a half without mail. TO THE OLYMPICS: The Bering Strait School District paid all expenses for KNOM news director Laureli Kinneen to travel to Anchorage for the statewide Native Youth Olympics, provided that she chaperone the girls’ team. She did a bit of coaching, too. Competitors are junior high and high school students. Traditional northern sports are “really tough,” Laureli says, tests of endurance and strength. Perhaps the most difficult is the seal hop, in which contestants hop forward on their knuckles while in a pushup position. Years back, Laureli herself competed in the games, and one year was Statewide Outstanding Athlete. ONLY IN NOME: Young Sam Schmidt was cross-country skiing up a 1,200 foot hill just north of Nome when he called mom Lynette from his cell phone. It seems that he had stumbled on a herd of musk oxen which were eyeing him suspiciously, and he decided that a retreat was called for. REUNITED: The young boy’s dad was frantic when he didn’t return home from school one day last month. Police gave KNOM an emergency announcement, and the boy was located within minutes. Thank you for joining us online! INSPIRATIONAL SPOT: Lord, walk beside me throughout this day. Give me the courage to love those I touch. 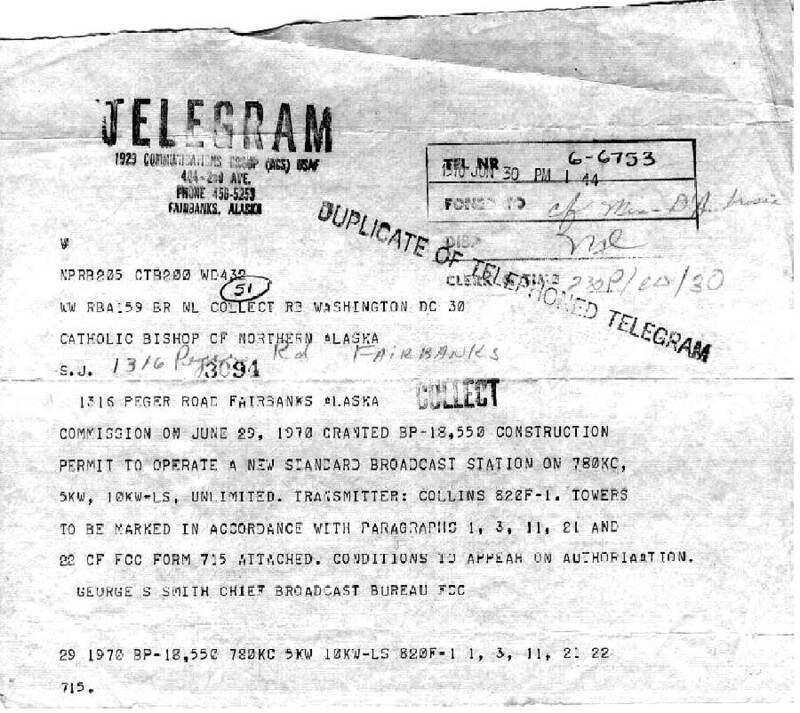 FORTY YEARS AGO: (left) June 30, 1970, a telegram arrives in Fairbanks with fabulous news, that the Federal Communications Commission has granted the Catholic Nome radio project permission to begin construction of the new station. There is joy and cheering, and a rare cake at dinner that evening. 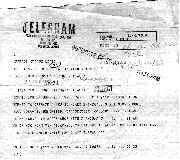 Following afternoon word by telephone from Bishop Robert Whelan, SJ, a $50,000 equipment order is in the mail within an hour. The order is for dozens of things, from the huge 10,000 Watt transmitter to three pairs of headphones. THIRTY YEARS AGO: From Wasilla, Alaska, in June 1980 tower rigger Rod Ewing gives the 230-foot KNOM tower its first recoating of aviation white and orange paint. The tower needs repainting about every ten years. (Left) In 2000, Rod is still looking after the tower. 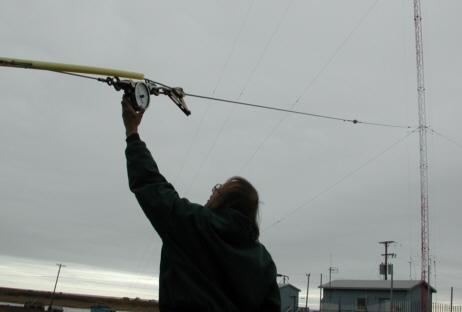 Here, he measures tension on a guy wire. TEN YEARS AGO: June 10, 2000: At a gala Washington, DC event for Crystal Award winners and others, KNOM program director Ric Schmidt meets prominent politicians and TV stars. All of Ric’s expenses are paid by the National Association of Broadcasters, which awarded KNOM the honor. It is KNOM’s second Crystal, and the station wins two more, in 2003 and 2005. WE RENEW OUR PROMISE TO YOU that out of respect for you and your privacy, we will never give your name and address to anyone, for any reason. We’re already out of space! Thank you again, so very, very much. We continue to pray that Our Almighty Father rewards you abundantly for your kindness and your generosity. You are providing a great gift to the isolated people of village western Alaska. May God shower you with blessings for your thoughtfulness!